I can be a life coach. Seriously. I’m glad that my sister, Jholen, allows me to practice my coaching skills on her when she was still here. I will usually call her one fine afternoon, ask her to jot down notes and I will just talk. Most of the time she’s quiet, would just nod and agree. Who knows what she thinks of our sessions. I never asked but I would like to think it’s enlightening and at least made her think about life. 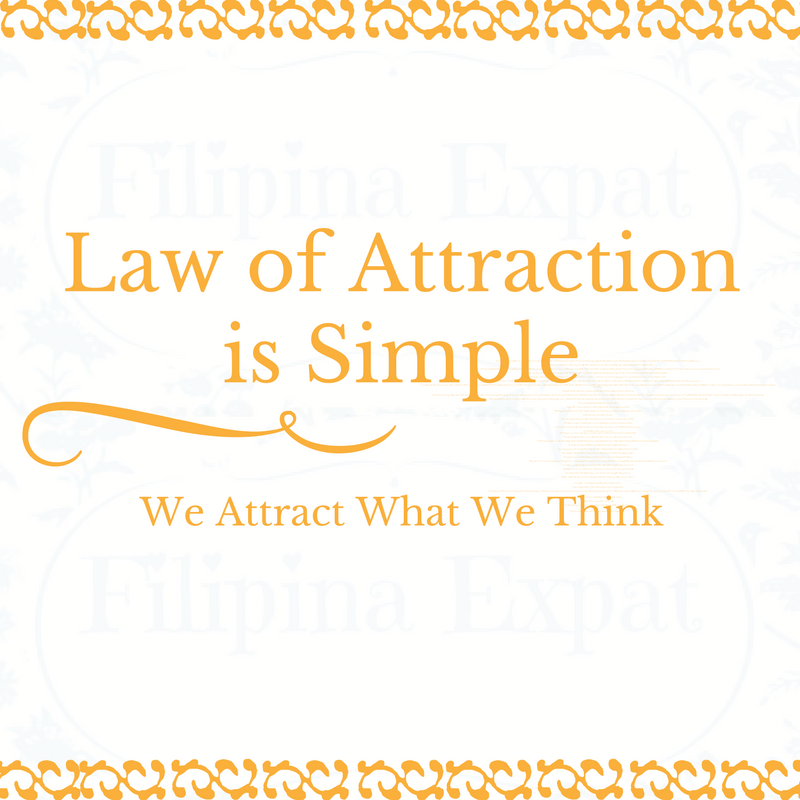 I always talk about positivity, about law of attraction, about getting whatever you want because you deserve it. Do you agree that whatever we have right now is because we wanted them. Our shoes, bag, mobile phone, the job we have right now, the school where our kids are studying, our house. We have all of them now because we wanted them. It started with a desire and we believe that we can have these things and, true enough, we have them now. We attract what we think. Our mind is so powerful beyond our imagination that if you are able to harness your mind to attract all positive things then the result is unbelievable. It seems too easy that you become doubtful. We have been conditioned all our lives that success is something we should work hard for. But you know what, it’s working SMART than working HARD. You can work hard all your life but that is not enough. I believe that working smart AND using the power of your positive mind is the combination that will make you reach your heart’s desires. On the flip side, we have to catch ourselves when we think about negative thoughts. It might be harsh to hear but all sickness, all our relationship and family problems, our money issues and stress at work is something that we also attracted. We should always remember that whenever we think earning money is difficult, then earning it will be hard. Whenever we say that life is unfair, everything will just go downhill. We attract what we think. How many times have you thought of starting a business but was discouraged that you don’t have enough capital to start or you’re inexperienced? Or you have your own business now but thinking you can’t expand further. That you are just ‘small time’ and wishing to grow it further is just greedy? Or you’ve been stuck in your low paying and stressful job for the longest time and doubtful that you can get a better one? Or buying a house will only be a dream as your salary is just enough to make ends meet. If you see yourself in any of these situations, then it’s time to change your mindset. What you believe will become your reality. It’s really that simple. Instead of focusing on the negative, let us focus on what we want to achieve. Instead of doubt, let’s practice positivity and gratefulness. Some exercise for you: Imagine this – it’s the start of the day, can’t drag yourself up from bed. You’re dreading to get up and come to work to see your a**hole boss and your a**hole colleagues. You hate your work with passion. You’re depressed because even after several months of searching for another job, the result is fruitless. No calls even for an interview. Your destined to be in your rotten job forever. How dreadful, right?! But what if you change the way you think every morning and do this instead: It’s the start of your day. Before even stepping out of bed, you whispered a short thank you. Thank you for another day, another chance to live. Gratitude that you have work as there are millions of people wishing they can find a job. If you’re really keen to find another job then think about the new job everyday. Imagine how your new office would look like, how amazing your boss is. How fun and helpful your co-workers are. Imagine how you would feel on getting that interview call and nailing it. In the meantime, just be grateful to your current job and try to see the positive in your workplace. Remember that your officemates are not demons. They are people just having issues. Be passionate. You have a better life than them. I am not very bright. I didn’t graduate from an exclusive school. I am a smart worker. I have a good paying job. I am on my way of launching my own business. I am always thankful. I am positive. I also believe that I can travel the world, retire at age 40, be an inspiration to fellow Filipinos and encouraged them that we are more than a skilled worker. I still have a lot to accomplish. I can still earn more. The way my mind works help me a lot to achieve most of the things I have right now and the positivity that I practice will help me achieve what my mind can perceive. I am a positive thinker. If I am experiencing a setback or negativity, I know that it is temporary and I am confident that I’ll be able to change things quickly. However, I am aware that I need to work on my tendency to blame myself. I feel responsible for others. I always remind myself that I cannot help everybody.That is why I keep on reading self-help books. I also read articles that will boost my confidence and belief that I can do whatever I want. I read about money, how to save, business, selling and anything that will enhance my business knowledge and financial literacy. Being positive will result in positive actions. Once you focus on the positive aspects of a situation, everything seems to be easier. Life becomes easy. I remember my aunt who keeps on telling me for years that her dream is to own a house. But at the same time she keeps on saying that it is impossible as her salary is just enough for everyday expenses. I’ve been hearing this litany for years until one day, when I just couldn’t take it any longer, I told her that if she really wants to have her own home, first believe that she will get it. Of course her initial reaction is doubt. How can it be possible if she doesn’t have any savings and no bank will give her a loan? I told her that if she really wants it, she will get it. I know that if you want something so badly, your action will direct you towards your goal. The following year after that conversation, she was able to buy a vacant lot. She took a loan from a family member and was able to pay it off after a year or so. After that, she took another loan from another family member, and built her own home. Yes, it is small but it’s her own. She doesn’t need to rent again. Now, she is very vocal that my words are true. Just believe you can have it and it will be given to you. As I said, it’s very simple. Here are some great people practicing positivity and their words resonates with me. Napoleon Hill – an American author who was one of the earliest producers of the modern genre of personal-success literature. “When defeat comes, accept it as a signal that your plans are not sound, rebuild those plans, and set sail once more toward your coveted goal. Robert Kiyosaki– is an American investor, entrepreneur, and well known author. He wrote the Rich Dad Poor Dad series of motivational books. Lisa Nichols – is a powerful advocate of personal empowerment. She is the co-author of Chicken Soup for the African American Soul. Jack Canfield – co-creator of the phenomenal bestselling Chicken Soup for the Soul series. Henry Ford – as an American industrialist, the founder of the Ford Motor Company. This entry was posted in Musings and tagged Dubai blogger, filipina expat, filipino expat, Law of Attraction, Pinoy Blogger, Pinoy in Dubai.